UNPO asks for additional report from China to account for the situation in Tibet in a joint statement to the Committee Against Torture. Below is the statement by UNPO, ICT, FTC and TCHRD, which can also be viewed as a pdf document. While welcoming the opportunity to present this Joint NGO Statement[i] before the Committee Against Torture (CAT), we focus on China’s response to the List of Issues (CAT/C/CHN/4) with regard to the urgent human rights situation in Tibetan areas of the present-day People's Republic of China. Our assessment is that China failed to respond[ii] adequately to the pertinent questions from the Committee. On the denial of massive number of arbitrary detentions of Tibetans since 10 March, the U.S. Congressional Executive Committee on China stated that the Chinese authorities confirmed the arrest of 4,434 Tibetans, including those who "surrendered". According to this analysis the fate of 1,249 Tibetans remained unknown as of June 2008. [iii] Furthermore, various reports stated that Tibetans detained in the "Tibet Autonomous Region” (TAR) were transported to different locations, including around 300 prisoners arriving at the train station in Xining, Qinghai Province, in early April. Tibetan sources said: "Every prisoner seemed to be hurt badly and some had blood on their faces. There was an old lady in the group with heavy shackles on her feet, and no shoes. She was being beaten by the police." Other reliable reports reveal that a large number of Tibetan detainees were taken from Lhasa to detention facilities in Sichuan and Qinghai provinces, either by train or by road. A young monk who was detained in Lhasa for having no identity card was taken to a local detention center and beaten severely every day over a period of several days, according to one report. "Four men beat him at the same time, each time," one source reported. "During the torture, he had no comprehension of night and day. With one arm up over behind the neck and the other under and behind the back, they tied his wrists together behind his back. The food at the prison consisted of one small bread roll per person and about 20 ounces of water that was shared between four to five people. People were sleeping in the area where they went to the toilet and they were not allowed to wear shoes." On China's denial on the use of force to suppress the predominantly peaceful Tibetan Uprising, we believe facts on the ground and visuals reaching the outside world do not support Beijing’ claim. This Uprising involved more than 125 protests covering over 60 counties in the Tibetan areas followed by China military crackdown, called a "people's war". Zhang Qingli, the Communist Party Secretary in the "TAR" clearly stated China’s intention when he said: "We are currently in an intense bloody and fiery struggle with the Dalai clique, a life-and-death struggle with the enemy." According to information reaching our organizations and the Tibetan Government in Exile between 140[iv] - 218 Tibetans[v] died during protests since 10 March. One sad aspect here is that there were many cases of Tibetan families not being allowed to take custody of the dead to offer funeral services but instead were given the ashes of the deceased. 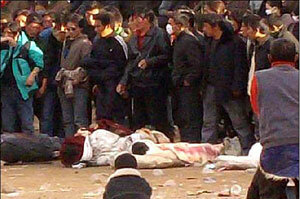 There were even multiple witness accounts from Lhasa stating that bodies of the dead were loaded into military trucks. Mr. Chairperson, concerning the claim of the guaranteed legal rights and representations for Tibetan detainees, China fails to provide the full information, including of those Tibetans outside the "TAR" who have been sentenced. The direct threats imposed on Chinese lawyers who volunteered to defend Tibetan detainees show the very discriminatory nature of legal system of Communist China. Ultimately, this Committee must understand that this legal system is politically motivated against Tibetans who engage in political activities because the system is maintained to safeguard the interests of the Communist Party of China. The Committee must, therefore, seek full explanation of the 116 Tibetans whom China said were under legal investigation as of June 2008, as its November now, and when the claim is that this is the current figure of detainees in the “TAR” following the Tibetan Uprising. As this Committee is aware, since March, an overwhelming number of Tibetan monks, nuns, schoolchildren, farmers, nomads, artists, intellectuals and religious teachers, either disappeared or were detained, facing routine and extreme brutality whilst in custody. Unarmed peaceful protesters have been shot dead, while others have died following torture in prison or in their homes or as a result of suicide due to despair over the crackdown or being forced to denounce the Dalai Lama. 38 year-old Nechung, a mother of four minor children, died after her release from detention on 26 March 2008. She spent nine days in prison facing brutal torture. When she was released, her health was in an extremely critical condition. There were many bruise marks on her body, she was unable to speak and eat, constantly vomiting and could hardly breathe properly. [vi] Like many torture-victims, she was she was denied medical treatment from the local hospital. Another case is that of the enforced disappearance of Tibetan AIDS activist Wangdue, a former political prisoner, since his arrest on 14 March from his home in Lhasa. [vii] The whereabouts of Venerable Sonam Rabgyal and four other monks of Ramoche Temple from the Tibetan capital are yet to be ascertained following their arrest during a midnight raid in monks' residence on 7 April 2008. [viii] Similarly, the whereabouts of many of the Pangri nuns – some severely beaten in public in the process of being detained -- remains unknown, as do the whereabouts of the abbot of Pangri, Phurbu Rinpoche, a well-known and respected figure in Karze, Sichuan province. [ix] No one knows where Dhondup Wangchen, 37, a Tibetan who made the film, “Leaving Fear Behind”, is today , following his arrest in March although his assistant Golog Jigme was released on 15 October after more than six month’s detention. As for extrajudicial killings, in one case, a demonstration near Kirti monastery in Ngaba Prefecture, Sichuan Province on 16 March left 10 to 20 demonstrators dead and about 30 monks from Kirti monastery missing. Local people assumed that they had either been killed or secretly detained. Finally, as this Committee began its session on Monday, Jigme (aka Jigme Guri), a Tibetan monk, who provided a rare first-hand account of China's crackdown on Tibetan protesters to foreign media was re-arrested. "Around fifty People Armed Police (PAP) and Public Security Bureau (PSB) officials in several military trucks came to Labrang and raided a Tibetan home from where they arrested Jigme and took him away in a military vehicle. And nobody knows where he was taken to and for what reason". Mr. Chairperson, while recognising the unresolved case of the enforced disappearance of Gedhun Choekyi Nyima, the Eleventh Panchen Lama, as a continuous crime, we refer the Committee to China's unfulfilled task before the Working Group on Enforced or Involuntary Disappearance which in 1997 requested documentary proof that the Panchen Lama and his family members did not wished to be disturbed. [xii] We request you to take note of China's last response on this case to the Special Rapporteur on Freedom of Religion or Belief[xiii] and urge the Committee to strongly support the call by the Committee on the Rights of the Child that an independent body be given access to visit the Panchen Lama and his family members. Following the Tibetan Uprising, an intensified form of the 'patriotic education' campaign is being carried throughout the Tibetan Plateau. Monks and nuns are routinely harassed and subjected to severe mental anguish by being forced to publicly denounce the Dalai Lama. Their spiritual and temporal leader is defamed as "a devil with a human face but with a heart of a beast" and Tibetans were told that: "The communist party is like parents to the Tibetan people …The party is the real Buddha for the Tibetans." In 2006, the UN Special Rapporteur, Dr Manfred Nowak stated in reference to re-education through labour that re-education, violates the right to personal integrity, dignity and humanity, as protected by the International Covenant on Civil and Political Rights and the Convention Against Torture. It is aimed at “breaking the will of detainees and altering their personality and was characterised as “a systematic form of inhuman and degrading treatment or punishment, if not torture. Like Re-education through Labour, evidence from Tibet demonstrates that Patriotic Re-education aims to break the will and personality of individuals, including through the use of physical torture. We therefore recommend that the Committee characterises Patriotic Re-education as form of inhuman and degrading treatment or punishment, if not torture. New measures have been implemented to collectively punish and purge monasteries of monks and nuns and ban worship in the wake of the protests. These include measures created specifically to cause public humiliation or extreme mental anguish among the monastic community; revealing a systematic new attack on Tibetan Buddhism led by Chinese Party Secretary and President Hu Jintao that is reminiscent of the Cultural Revolution. Distinguished Members, in many cases it would be possible that victims would appear before you following a human rights crisis situation as being experienced by the Tibetan people. In the Tibetan situation, this is not the case. However, the presence in this room today of Mr. Takna Jigme Sangpo and Ms. Phuntsok Nyidron Sanaschigas is the evidence of two generations of Tibetan torture-victims who survived to appear before the Committee. These two Tibetans, one old and one young, separately spend a total of 47 years in prison out of their total sentence of 58 years! Such is the fate of the Tibetan people! - To seek an additional report from China to account for the situation on the Tibetan Plateau, including the official figures on arrests, killed, injured, disappeared and sentenced. - To encourage China to receive the High Commissioner for Human Rights to visit Tibetan areas in China as a follow-up to the request made by the former-High Commissioner on 27 March 2008. - To welcome the recent visit of the Norwegian Parliamentary Delegation to “Tibet Autonomous Region” and urge the Chinese authorities to receive Special Procedure Mandate-holders to conduct fact-finding mission to Tibetan areas. - To urge China to abolish the Reeducation Through Labour (RTL) system, implement a moratorium on executions, launch of a human rights education programme and establish a national human rights institution based on the Principles. -To urge China to conduct a national inquiry on all cases of custodial deaths and extrajudicial killings that gives equal attention to cases involving Uyghurs, Mongolians and Tibetans. -To urge China to sign and ratify the International Convention for the Protection of All Persons from Enforced Disappearances. In conclusion, allow me to share with you these words of the Dalai Lama when he addressed a group of reporters in Tokyo on Sunday: “Tibetans are being handed down a death sentence. This ancient nation, with an ancient cultural heritage is dying …Today, the situation is almost like a military occupation in the entire Tibetan area ... It is like we're under martial law. Fear, terror and lots of political education are causing a lot of grievance." I thank you, Mr. Chairperson. * Delivered by Mr. Vincent METTEN, International Campaign for Tibet. [i] The following NGOs affiliate themselves with this Statement: Tibetan Women's Association (TWA), Tibetan UN Advocacy (TUNA), Society for Threatened Peoples (STP), Asian Indigenous and Tribal Peoples Network (AITPN) and Mouvement contre le racisme et pour l'amitié entre les peuples (MRAP).